just below the town is of extreme historic interest (see text). Burial sites containing metal funerary objects on Mt. Taburno and the area of modern Montesárchio attest to settlements dating back to the end of the first Iron Age (c. 900 BC). Later, beginning around 700 BC, more ornate artifacts, pottery, coins, and other evidence indicate influences from and exchanges with the new Greek enclaves along the Italian coast, i.e. Magna Grecia. The inhabitants of Taburno were what we now call the Caudine Samnites, part of the larger Samnite group. After the Longobards, Montesárchio was then occupied by the Normans (Roger II, founder of the Kingdom of Sicily) in 1137 and then by Frederick II (early 1200s). Under the Angevins, Montesárchio was part of the Della Leonessa fief (1268); in 1460, under the Aragonese, it passed to the counts of Carafa and then in 1540 to the princes of d'Avalos. It was under the Aragonese that the cylindrical tower was restructured into the form evident today; thus, the term still used today—the "Aragonese Tower". By the 12th century Montesárchio was a typical medieval hill-town protected by the older tower, the newer castle, and a defensive wall. It wasn't until much later that the populace started to creep down the slopes to where the modern town of Montesárchio lies. The Spanish refortified some of the site in the 1500s, although the major emphasis of the Spanish viceroys such as Toledo was on coastal defenses to protect the Bay of Naples, itself. During the Bourbon rule of Naples in the mid-1700s, the tower was a prison, and during the Risorgimento held illustrious "patriot" prisoners such as Carlo Poerio, Nicola Nisco, and Michele Pironte. During the early years of the 20th century, the premises were a penitentiary and, later, even an orphanage. In 1994, the complex was expropriated by the Ministry of Culture and converted into the National Archaeological Museum of Caudine Samnium. Not far from Montesárchio—out of the Caudine Valley, right around the corner of the mountain to the north—is a town called Sant' Agata de' Goti. 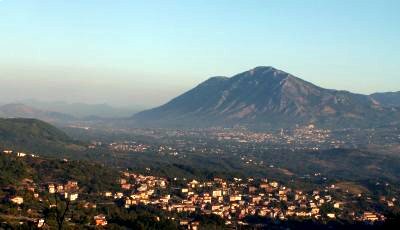 It blocks entrance from the Volturno Valley to the Caudine Valley and the highlands in the interior, which is what it was supposed to do when it was still a pre-Roman Samnite town called Saticula. It was the "other" Caudine Samnite fortress town in the area. Samnite tombs from around 700 BC have been identified. The entire area, of course, is overlaid with later Roman fragments; in this area, at least, such remains tend not to be massive and monumental Roman masonry, but Roman roadbeds, some tombs and a few rustic farmhouses. "Yes, folks, it is just this idyllic!" The Taburno massif evident above Montesarchio in the photo at the top of this page has since 2002 formed the Regional Nature Park of Taburno-Camposauro. It extends for about 12,000+ hectares (30,000 acres/47 sq. miles) over most of the massif to include the other principle peaks, Camposauro (1388 m), Alto Rotondi (1305 m), Sant'Angelo (1189 m) and Pentime (1170 m). The total population of the 14 inhabited centers within the park premises is 25,000. The area is of considerable interest from the point of view of flora and fauna; historical interest (it was an Oscan-Samnite stronghold in the days when Rome was still warring with competing tribes for the control of Italy; and geological interest —the massif is limestone and hosts a number of grottoes such as San Simeone and San Mauro, both of which have served as "cave churches" as well as emergency shelters for shepherds throughout the centuries and even bomb shelters in WWII. It is a marvelous place to go hiking. The park publishes an extensive list of available hiking trails, all with names such as Trail of the Mills, the Bandits, Wine, etc. The lists carry (in Italian) descriptions of the trails and downloadable handy maps. That list off-site at this link.